To preserve and expand public education, educators and parents will have to fight not only free market zealots like Betsy DeVos, but Democrats like Dwight Evans. Evans at a 2007 rally during his campaign for Mayor of Philadelphia. A massive free-market shift has transformed public education over the past two decades. Where public schools were once fairly robust, they are now being marketized, and power is being taken away from parents and education workers. We expect Republicans to zealously promote this kind of policy, but, in many cases, Democrats have been the most effective school neoliberalizers — especially in America’s cities. Recently, Dwight Evans, a former Pennsylvania state representative now serving in Congress, explained how he “imploded” the public governance of Philadelphia’s schools. While more dramatic and publicly self-reflective than most other school privatizers, Evans’s story shows just how zealous the Democratic side of the bipartisan effort to erode public education can be. In 1998, the Philadelphia school district — along with ten black and Latino parents, the mayor, the superintendent of schools, the NAACP, black clergy in Philadelphia, and others — sued Governor Tom Ridge and state secretary of education Eugene Hickok. Powell v. Ridge (1998) claimed that Pennsylvania wasn’t funding its schools fairly. According to the commonwealth’s formula, the poorest school districts received about 33 percent less than they needed while the wealthiest districts got that much more. The funding formula was not only wrong, it was illegal: the defendants claimed that it violated the Civil Rights Act. After a failed attempt to file suit in state court, the city took its civil rights case to federal court. The plaintiffs argued that the state’s funding model was racially discriminatory because it denied adequate funding to schools that served predominantly non-white communities. As the Public Interest Law Center writes, if the case had been successful, it would have represented a groundbreaking new legal strategy for ensuring that states fully fund their public schools. As the case progressed, David Hornbeck, Philadelphia’s school superintendent, made an unusual threat. Since the commonwealth wasn’t fulfilling its obligation to his city’s schools, he was going to use city money to pay for them. The budget shortfall was so massive that city funds would run out quickly, and Philadelphia’s schools would have to shut down before the end of the year. Hornbeck thought that this strategy would viscerally demonstrate the funding formula’s inadequacy. At the time, Democrats controlled the state legislature, and Dwight Evans was serving as chair of the House Appropriations Committee. Evans, who had nearly twenty years experience in the legislature, responded to Hornbeck and the civil rights case counterintuitively. Rather than supporting the plaintiffs, he worked with the defendants. Evans partnered with Ridge and Hickok to write Act 46, a law that amended the Pennsylvania School Code to allow the state to take over schools deemed in “financial or academic distress.” The act also created the School Reform Commission (SRC), a body of state-appointed officials who would govern in place of the school district, and significantly limited teachers’ ability to strike and bargain collectively. Act 46 passed in 1999 with bipartisan support. It transformed school governance in Philadelphia, paving the way for eighty charter schools and a severely disempowered teacher’s union. Powell v. Ridge stalled in the federal courts on technicalities. The coalition behind the case, and Hornbeck’s threat, fractured amidst political pressure. When Evans introduced Act 46, he had a choice of strategies: he could have supported the demand to properly fund the school district, drawing from the political and legal tradition of the civil rights movement to help the plaintiffs in Powell v. Ridge. Instead, he paved the way for an undemocratic takeover of city schools. Evans grew up in North Philadelphia, a neighborhood struggling with high unemployment, crime, and segregation. His mother worked for a telephone company, and his father left the family when Evans was fourteen. Profiles of Evans written in the early 2000s emphasize his strong work ethic. Evans’s mother Jean had to fight to make sure her children got the right opportunities. She moved the family from North Philly proper to the Germantown neighborhood, then to West Oak Lane so that young Dwight could attend a better-performing school. My mother manipulated an address to get me into another school in the ninth grade. . . . All of a sudden I knew something was different about this particular school. I particularly found out about this in algebra class, where the teachers were not playing around, and they were very much determined and I ended up in summer school. [T]he Evanses were a part of the little-known history of intra-migration in Philadelphia — black flight, you might call it — and you can see how the values behind those choices made an impression on Evans. His career has been guided by the idea that government should bring stabilizing institutions — schools, supermarkets, community development organizations — to neighborhoods. The concept plays on white flight, when white families left urban and suburban areas in order to avoid black neighbors. Black flight, in this context, describes those African American families who moved toward opportunity and away from anything that might compromise that pursuit, including their own communities. His childhood — which taught him the value both of working hard and changing positions to achieve success — would inform Evans’s strategy as a politician. After several successful elections to state-level positions, Evans ran a string of failed campaigns for higher office. He made unsuccessful bids for lieutenant governor (1986), governor (1994), and mayor of Philadelphia (1996 and again in 2000). When Evans ran for mayor six years later, the union raised $150,000 to fund one his opponents. The teachers shifted loyalty because of how Evans’s handled the great school crisis: feint to the left, but dart right. It’s worthwhile to hear Evans tell the story in his own words. In 2013, he participated in a panel celebrating the twentieth anniversary of the Center for Education Reform (CER), a pro-charter school advocacy group and driving force behind free market educational reform. In no uncertain terms — much like liberal education privatizer Jonah Edelman in Illinois — Evans describes how he worked with Republicans, and against unions, to destroy democratic control of Philadelphia’s schools. The Ridge administration . . . at that particular time was pushing vouchers. . . . Republicans controlled the House and Senate, but they couldn’t get their package through. They were stuck. . . . I introduced a package to implode the Philadelphia School District. I said I want to implode the Philadelphia School District and I want to redefine how education is done. I want to change governance, I want to change management, I want to change recruiting, I want to do everything. Now there weren’t many people, you’d imagine, who jumped on my bill. It even scared the Republicans. But I said, “Look, we have to do something.” So simultaneously while the Ridge administration is pushing their initiative, I’m pushing my initiative. . . . I need their help . . . on what ultimately became a school takeover and they needed my help to do charter schools and whatever else they had. Gene Hickok and I developed a very good relationship. He came down to my district and we spent some time talking. . . . So I said we need to change the power arrangement. And the way to change the power arrangement was to do it through state law. That’s the initiative that I introduced. I introduced an initiative to change the power arrangement. His plan created the legal foundation for the undemocratic SRC. Another Democrat, Philadelphia mayor John Street, would transfer control of his city’s public schools to this unelected board in 2001. Elected officials must intentionally hand school management off to privatized and marketized arrangements, giving the elite — whether in the form of educational management operations, philanthropic donations, or charter organizations — more control over schools than voters. Dwight Evans completed such a handoff. He changed the gravitational forces in education, making schools in Philadelphia dramatically less democratic. John Street, who as a city councilman had been a plaintiff in Powell v. Ridge, had become mayor of Philadelphia the year before. After Schweiker declared his city’s schools “in distress,” Street brokered a deal: the state could take over his city’s schools if it increased funding by $75 million and allowed him to appoint a member to the SRC. Schweiker accepted, and the largest state takeover of a city school district in American history took place. The SRC still runs Philadelphia’s schools. Like the emergency water commission in Flint, Michigan, and the unelected commission now in charge of Puerto Rico’s debt via the PROMESA program, it ensures that Philadelphians have no say over who controls their schools. The state appoints four of the six officials in charge of the district. Meanwhile, teachers have gone without a contract for four years. Eighty charter schools have opened in the city, including one that Evans himself founded. And after all this, the state still underfunds its schools. A teacher in Philadelphia recently bought billboard space to advertise this fact. 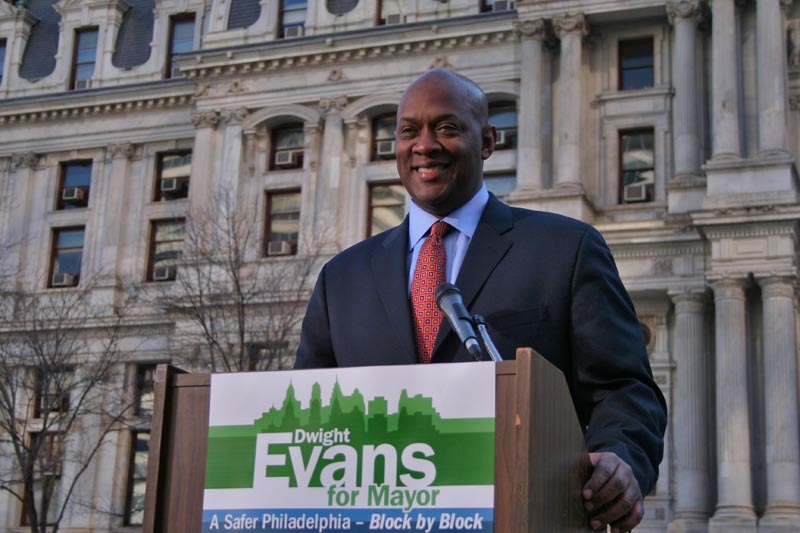 Dwight Evans now holds national office, having won a special election to the House of Representatives after Chaka Fattah resigned amidst a scandal. While Evans made national headlines when he boycotted Trump’s inauguration, history will remember him as a key neoliberal figure who worked with the most conservative Republicans to make Philadelphia’s schools undemocratic. In his own words, Evans “changed the power arrangement”: he took power away from voters, who can no longer hold their leaders accountable for decisions about schools, and from workers, who can no longer hold management accountable for its decisions about teachers’ working conditions and students’ learning conditions. Evans doesn’t stand alone. Democratic support for charter schools has been strong for decades. Democrats for Education Reform (DFER) has advocated following Evans and imploding school districts across the country. During the 2016 presidential election, the group highlighted Hillary Clinton’s support for charter schools, citing speech after speech from as early as 1983. Unfortunately, what Evans’s case shows — and what Clinton’s plagiarism of DeVos confirms — is that, for schools, there is only one political party: the one committed to markets, not students.